I spent December immersed in another post-war story, having binge-watched three seasons of Call the Midwife with my parents and husband. Of course, that story was post WWII, and this one was post WWI, but if you like that show, chances are that you will love – or at least appreciate – this novel. 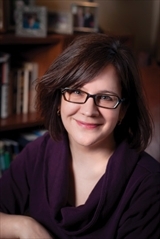 Author Jennifer Robson is amazing at putting in the tiny details that make scenes seem so realistic – the sound of footsteps, the look in an eye, the scent of tea – whatever, but she’s equally amazing at making us feel as though her characters are fully formed, dimensional people, from their very first appearances. In my case, I was hooked on this story the second Charlotte used five pounds of her own money to help someone, and not just because it’s something I would have done, in her position. While this novel deals with some very deep subjects – how do we find ourselves after a national tragedy? How do we define ourselves in a world that is constantly in flux? Dare we turn away from people who are in need of help? – it is also full of hope and joy. The hope that life will be better, that new relationships will thrive, and the joy of breaking bread and sharing stories with friends, and of opening ourselves to new loves, and new possibilities. If you think historical romances have to be bodice-rippers or require bare-chested men in kilts, or the clank of armor (not that any of those things are bad) then your definition of the genre is severely limited, and this book will open your eyes to what history and romance can really be. 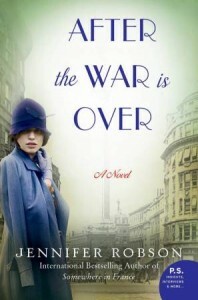 If you already know this, then trust me, you need to read After the War is Over because Jennifer Robson is destined to be an important voice in fiction. Goes well with Fish & chips, wrapped in newspaper and served with a dash of vinegar.